U.S. Rep. Darin LaHood, right, chats with Judge Bill Yoder following a Republican Party breakfast in Bloomington on Monday, Nov. 20, 2017. 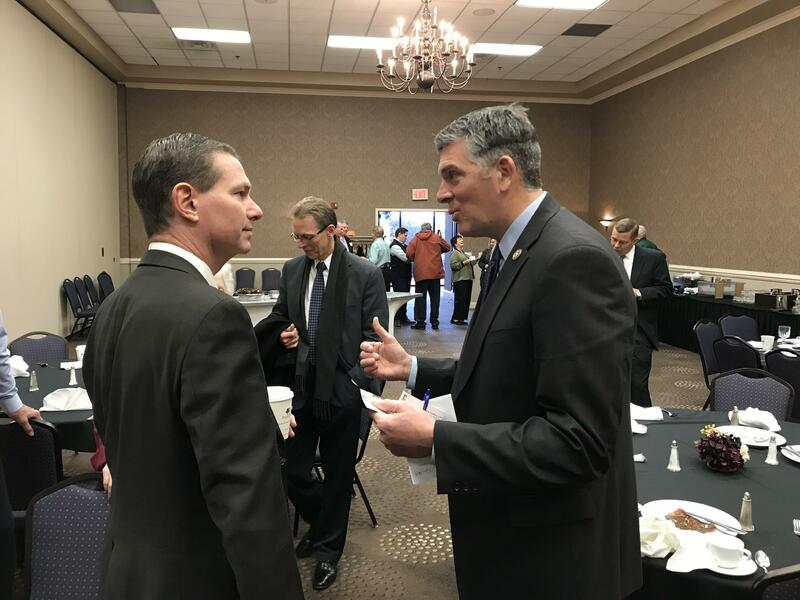 During a Republican Party breakfast Monday in Bloomington, LaHood accused Democrats of demagoguery in opposing the measure he says helps most people. "If you have a home that's less than $500,000, which 95 percent of my district does, you're going to continue to get your mortgage interest deduction. If you have property taxes of less than $10,000 you can write that off. People from $50,000 income up to $200,000, the middle class there, you're going to get a tax break," said LaHood, a Peoria Republican. LaHood says he's disappointed the property tax provision is not in the Senate version of the bill. Democrats have said most of the benefits from the bill go to big business and the very wealthy. They also worry about running up the deficit. LaHood said unlike other tax cuts in the past that have ballooned the deficit, this one will be different because it will spark enough economic activity to increase federal revenue. "Republicans generally were divided on the approach on healthcare philosophically which way to go. No one is defending the federal tax code. And no one should, right? There will be a few differences we will have to work out between the House and Senate. And I'm confident we can do that by the end of the year," said LaHood. LaHood said he also favors House language doubling the standard deduction. An excerpt from GLT's interview with Rep. LaHood. GLT's full interview with Rep. LaHood.